can’t you see what I want? Coyotes spend a good deal of their day sleeping. Members of a pack or family may sleep within close proximity of each other, or they may sleep much further apart, but probably within the same couple of acres of each other. They have amazing built-in time clocks, but they also are influenced by circumstances of the moment. My own dog could tell the time and knew what was to be done at that time. For example, I always set off, with my dog, at exactly 2:40 to pick up one of my kids at school. But one day I fell asleep — I would not have made it on time except that my dog began poking me with her muzzle at exactly 2:40. Needless to say, I was amazed. The same is true for coyotes — they seem to know when it is time to meet up, but if people or dogs are around, they will delay. Most coyotes I know like to go trekking alone. After all, their staple diet consists of voles and gophers — animals that really can’t be divvied up very well. Might as well hunt alone. But some coyotes do enjoy trekking together, usually in pairs. When they hunt in pairs, there is usually a rendezvous beforehand. 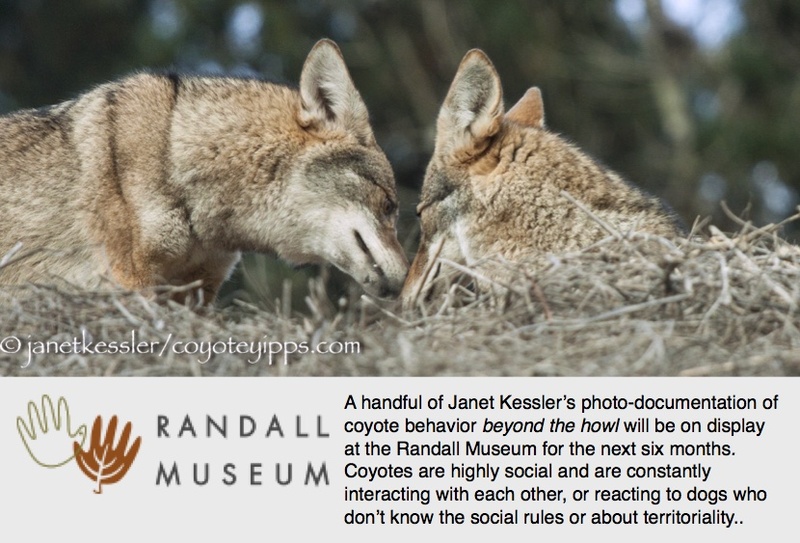 Rendezvous locations can remain the same for a while, or they can change drastically from day to day, but coyotes seem to have various favorite meeting spots which they alternate between for a while, before changing these altogether . This is where they congregate to then move together for their foraging. In this case here, the older female had spent her day sleeping in the sun quite some distance from where the young male had been also sleeping in the sun. The female was the first to move around — she disappeared into some bushes. In the meantime, I watched the male who moved from where he had been sleeping to a new location where he curled up and then dozed a while longer. Finally, he got up, stretched, scratched, and began to forage. I watched him catch a vole and toy with it. He continued searching for voles and then looked up ahead. He must have seen the female approaching, because he sat down and watched intently. She trotted over, and arrived on the scene. The ritual began with hugs and kisses. They are hidden in the grass in these photos, but you can see what is going on. It was intense, but lasted only about a minute. That was the first phase of the meeting. Then there was a pause where all activity ceased. I think the male was waiting for something, but since nothing happened he turned around and backed into her — it looked like a request. He did it again and then looked over his shoulder: “well?”. The older female was obliging. She began grooming the young fellow, pulling off burrs and bugs. He accepted this, repeatedly laying his ears back against his head — he seemed to melt with the attention. There was care, affection, and intensity here which few animals that I have seen show each other. The next phase of the meeting involved trotting off together. From what I have seen in the past — though I did not follow them this time — they will spend their time together trekking, marking their territory, hunting, playing, exploring and maybe even meeting up briefly with a couple of lone coyotes who live adjacent to this territory, before again returning to separate localities to rest. Thanks for the photos! This KY farm family is disappointed that we haven’t seen our coyote neighbors lately – even on the game cameras. I can only think its because the corn is up – over 7 foot – and they are spending their time between the corn fields and the adjacent woods. I’m so sorry you haven’t seen them around — what a bummer! Hopefully nothing has happened to them — that is always the worry. As seen in these photos here, even tall, sparse grasses serve to conceal them somewhat. So I hope that they’re just trekking, unseen, through your thick corn fields — maybe nibbling on it here and there!? Yes, I think they are hiding in the corn! Just before sundown, I was driving our atv past the corn when a coyote dashed out about 10 ft ahead of me and raced up the hill. The coyotes I’ve seen this year are much lighter in color than the pair who used to live on our hill and much more reclusive. The male of our original pair was hit by a car last Fall and I wonder if this is a new family or if the female simply found a new mate. Is the color due to the season or are they really a lighter color? Again, thank you for your blog. I’ve learned a lot about their behavior. Coyotes are very much disliked in a farming community but when I start to talk about their family structure and point out that they are part of nature’s balance – people begin to understand, I think. Eliminate coyotes and be overrun with mice and rabbits. Nature has a purpose for all her creatures. What a life! I wish someone would pick the bugs off of me…. It seems like a cushy life, at least this part of it. But life for our wild critters is never easy as evidenced by their generally short lifespans: there are injuries that don’t heal well, bugs they can’t get rid of, diseases, inclement weather, food shortages, cars, unsympathetic humans. Hey, they deserve the cushy parts!! I have been searching online for a while, but I haven’t found a definitive answer. You seem to be fairly knowledgeable about coyote behavior, and I hope you can help me. I live in Rockwall, Tx. We have some beautiful coyotes out here. Remarkable close to shopping centers and smack dab in the suburbs. I moved onto some property near one of the local lakes and I have a hole in the ground that has almost a 4′ diameter, and it goes further back than I can see. It is about 7 feet back from the water, at the edge of some reeds that are growing up. I have no reason to think it is any specific animal, but there is an undeniable wet dog smell coming from that part of the property. Havent heard any howls or yips. Im waiting for some decent rain so I can look for tracks, but its pretty grassy back there. What do you think? Coyote Den? If so, am I putting myself in any danger walking down there? Yes, coyotes are becoming urbanized and suburbanized. I think it is fabulous that we can now spot these beautiful critters occasionally. I’m glad you, too, think they are beautiful! Your hole could very well be a coyote den. Pups are usually born in March, so keep your eyes open for them. Coyotes have no desire to encounter humans — they will avoid you and they will not willingly approach. There really is no danger to you walking down there. However, you should respect their need for space. The main things you would want to avoid is getting too close to the den, or getting between a mom and her pups. If that happens, the parents will warn you with an arching back and curling lips, and maybe even short darting sequences towards you. If this happens, please honor her wishes and walk away from the situation and place. Most issues from coyotes are caused by our pet dogs, so if you have a dog, you might leave it at home.